You give people plenty of ways to contact you about a purchase, right? And they don't call. They don't email either. What's the problem? Well, fact is over 80 percent of your leads aren't ready to buy from you at any given time, even if you have carefully targeted them with your demand generation campaigns. So, rule #1 is BE PATIENT. Rule #2 is NURTURE THEM. 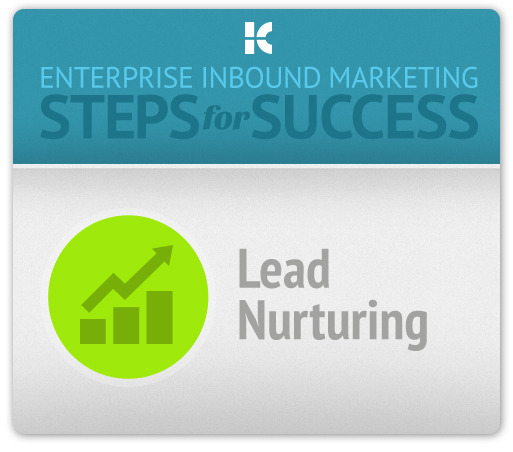 Lead nurturing is the next step in the Enterprise Inbound Marketing Process, and it's the one that gets your leads to the Promised Land, your qualified sales leads bucket. Here's how it works. You just visited a cool website that offers great looking offroad biking gear. There's a great ebook that's about the Best Biking Trails in Hawaii. Awesome, going there next month. Let's download and read that tonight after work. Next day you get an email thanking you for downloading the ebook and letting you know about some of the best blogs about biking in Hawaii. Sweet, and thanks for that. So on the treadmill the next day (you're getting in shape for the mountainous terrain), you whip out the iPad and start reading some of the blogs. You notice a couple of reviews and ads for rain gear (that you may very well need)—and they just happen to take you back to the original website where you started this journey. So you check out the rain gear product pages and read up on them. Maybe you'll buy something after work. An hour later you get an email from a consultant from the website inviting you to check out some of the special pricing they have available this month. Sure enough, there's some very cool stuff for way less than market pricing, including some great new bikes! Later that evening you get another email with a link to another review blog comparing the best bikes for Hawaiian offroading. You see where I'm going with this. But how did they do that? Well, it's no mystery that Amazon and other well-known online shops keep track of every click you make and personalize all kinds of content and offers just for you. That's lead nurturing. That's how you gently persuade people to buy from you. You get to know them, and then you give them what they want when they want it. Drip campaigns are fine, but they aren't responsive. They don't catch you at the moment you are thinking about buying something or doing some research. They're a blunt instrument compared to personalized content and lead nurturing, but they do have a place in just staying in touch and staying top-of-mind. Now we're getting fancy. We're doing the Amazon thing. Your marketing automation system should be able to provide personalized content and delivery based on lead behavior. Not all marketing automation software does this, so check the specs before you try this. Going back to our offroad cycling example, you are tracking every page visit, every download and every decision that your leads make (they need to become a lead first so that you know who they are). You can set up workflows that contain logical branches - if someone downloads the Hawaii cycling ebook, send them the thank you email with the blog links. If they click through on a raingear CTA, send them the special offers an hour later. If they buy something, send them offers for other big discounts for accessories. If they don't, send them a personalized email thanking them for visiting the offers page and giving them some more reasons to buy now. The possibilities are endless. The trick is to treat this form of automation like it's not automated. Try to be as personal and non-salesy as possible. Try to appeal to the excitement of cycling in Hawaii, not the advantages of your mountain bikes. You're trying to help them get the most of their adventure, not to make your sales numbers this month. Invite them to give you a call if they have any questions or just want to chat about biking in Hawaii. This is how sales is done in 2013. It works.